Tops on my list of “things I will never buy at the store again” is mayonnaise! There is definitely a trick to perfecting any mayonnaise recipe, but once you get the hang of it it’s easy. The best part of homemade mayonnaise is the hundreds of ways you can customize it . In the spring, my mayonnaise gets over-the-top delicious because there are so many fresh greens available in the yard. In my ongoing mission to encourage people to “eat their medicine,” I add things to everyday staples that many people have never thought of as “medicine.” For example, did you ever think mayonnaise could be served on a sandwich as a “dose” of an herb? Of course it can! If you are having an issue with your kidneys, you may want to get chickweed (Stellaria media) or dandelion (Taraxacum officinale) into your diet. I mean, drinking the same tea three times a day, or repeatedly swallowing 30 drops of a tincture, can get pretty boring. I want you to have fun with your natural health journey by using the herbs in your food instead! By making herbal mayonnaise you can begin to introduce your friends – and maybe even those resistant members of your family – to the new tastes of things such as lambs quarter (Chenopodium album) also known as wild spinach, or purslane (Portulaca oleracea). Your mayonnaise need never be boring again! 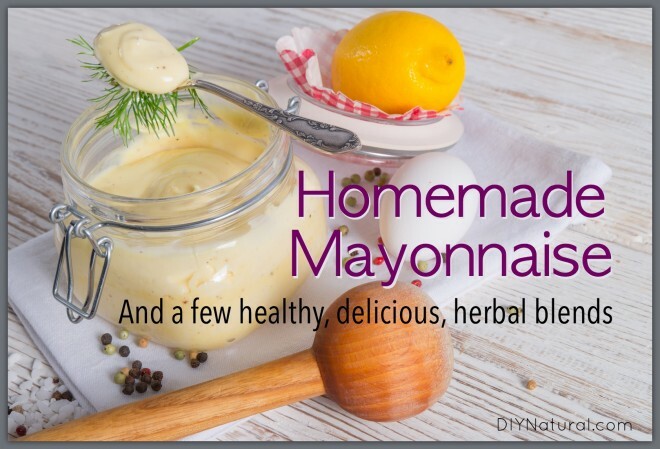 Your mayonnaise can become the base of many other healing foods because it mixes into so many other foods, like your child’s tuna or chicken salad sandwich. How about bite-sized “doses” of deviled eggs? Or coleslaw with nettle (Urtica dioica) mayonnaise? Why not throw in some lemon balm (Melissa officinalis) and lemon zest to boost concentration for those afternoon classes? So many parents struggle with how to continue to use healing herbs when they are away during the day at school. I love the look of surprise when I teach our students how to fold these herbs into ordinary condiments, like this mayonnaise recipe. You’d be surprised what you can do with ketchup and mustard as well! If everyone knew that getting their child to heal naturally was as simple as a sandwich spread, we’d all be a lot better off! In a food processor mix the yolks, mustard, lemon juice and garlic until they are blended. While the processor blades are turning, pour the sunflower and olive oil through the top spout in a slow, thin, steady stream (very slowly, it should take you several minutes to pour all the oil in). After all oil has been added and you hear the mixture thicken, add the salt, pepper, and herbs of your choice. This mayo can be eaten immediately, but the flavors will develop better if you chill for at least a couple hours before serving. Be sure to add a label to your mayonnaise creation before you put it in the fridge. If you’re like me you’ll have a couple different flavors at any given moment. Each recipe will last at least 4 days, but can several weeks to a month if you are using the best ingredients (pastured eggs, high quality oils like the ones linked to above, fresh squeezed organic lemon juice, etc.). 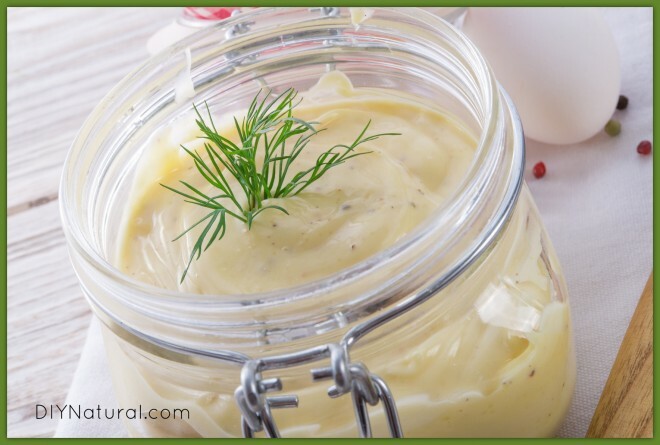 Have you experimented with herbs in your mayonnaise? What are your favorite herbs to use? My brother taught me how to make mayonnaise about twenty years ago, and I thought he was crazy. But it wasn’t too long before I was sold! Both on the cost and on the taste! I can hardly stand store bought mayonnaise in or on anything any more. After the first few attempts it comes really easy to make, but if it fails you can start over with the mix by just putting another egg into the blender and pouring the oil mixture back in very slowly with the blender on the highest speed. I have found that it works best with an egg that is cold straight from the refrigerator. It saves so much money that even if a little bit gets too old and has to be tossed it is so worth it. The taste makes it worth it, even if it wasn’t so inexpensive. 🙂 Learn to do it and then ENJOY! How long does the mayo last in the fridge. Coming right up! Since you asked, I’ll share that this week… Writing it up right now. Oops…just saw this Laura, I want to know how she makes mustard too! I love the idea of “medicinal” mayo! I have an over abundance of garlic chives in my yard, but dandelion? I’m going to have to try that one! Thank you! i remember my Dad used to make mayo for us and i think he used vinegar. can i use ACV? I always use ACV and I find it has a wonderful flavor. You really want fresh dandelions for mayo, though I suppose you could technically re-animate some dried dandelion. I get my fresh dandelion from my back yard or a wild area that hasn’t been sprayed. Any part of the dandelion will be edible, though for mayo I would try the flower or the leaf. I like to use equal parts olive oil, coconut oil, and avocado or walnut oil. I agree with all of your choices in oils, and in using the stick blender. That little blender is a whiz at making mayo, and it’s so very easy to clean up afterwards too! Any safety concerns with raw egg yolks? I don’t have any, but I would NEVER use anything but fresh, pasture raised, organic eggs. I have my own supply, but if you don’t you would be best to find a farmer who is raising them right… and don’t wash them until you want to use them. The chance of salmonella contamination comes with a chicken who is susceptible to infection and most importantly in eggs that have had their natural protective coating washed off. Everything you get in the store will be washed – it therefore has more chance of contamination and does not last as long. Thanks for sharing this recipe! We are getting 10 eggs a day and am always looking for ways to use them up and with mayo costing $4 a jar it is about time I start making it! I want to try this! But is it possible to make this with all olive oil instead of the sunflower? THANK YOU! I’ve been looking all over for what herbs to add to mayo. Many recipes just say “add seasonings”, but I didn’t know where to start. Like you, I’ve put mayo on my “never buy store-bought again” list, but I’d like to tweak it just a little, so I’m really glad to see these ideas!